Not to be confused with Excinuclease. Exonucleases are enzymes that work by cleaving nucleotides one at a time from the end (exo) of a polynucleotide chain. A hydrolyzing reaction that breaks phosphodiester bonds at either the 3’ or the 5’ end occurs. Its close relative is the endonuclease, which cleaves phosphodiester bonds in the middle (endo) of a polynucleotide chain. Eukaryotes and prokaryotes have three types of exonucleases involved in the normal turnover of mRNA: 5’ to 3’ exonuclease, which is a dependent decapping protein; 3’ to 5’ exonuclease, an independent protein; and poly(A)-specific 3’ to 5’ exonuclease. In both archaea and eukaryotes, one of the main routes of RNA degradation is performed by the multi-protein exosome complex, which consists largely of 3' to 5' exoribonucleases. RNA polymerase II is known to be in effect during transcriptional termination; it works with a 5’ exonuclease (human gene Xrn2) to degrade the newly formed transcript downstream, leaving the polyadenylation site and simultaneously shooting the polymerase. This process involves the exonuclease's catching up to the pol II and terminating the transcription. Pol I then synthesizes DNA nucleotides in place of the RNA primer it had just removed. DNA polymerase I also has 3' to 5' and 5' to 3' exonuclease activity, which is used in editing and proofreading DNA for errors. The 3' to 5' can only remove one mononucleotide at a time, and the 5' to 3' activity can remove mononucleotides or up to 10 nucleotides at a time. In 1971, Lehman IR discovered exonuclease I in E. coli. Since that time, there have been numerous discoveries including: exonuclease, II, III, IV, V, VI, VII, and VIII. 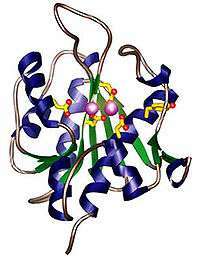 Each type of exonuclease has a specific type of function or requirement. Exonuclease II is associated with DNA polymerase I, which contains a 5’ exonuclease that clips off the RNA primer contained immediately upstream from the site of DNA synthesis in a 5’ → 3’ manner. AP endonuclease activity (later found to be called endonuclease II). Exonuclease IV adds a water molecule, so it can break the bond of an oligonucleotide to nucleoside 5’ monophosphate. This exonuclease requires Mg 2+ in order to function and works at higher temperatures than exonuclease I.
Exonuclease V is a 3’ to 5’ hydrolyzing enzyme that catalyzes linear double-stranded DNA and single-stranded DNA, which requires Ca2+. This enzyme is extremely important in the process of homologous recombination. Exonuclease VIII is 5’ to 3’ dimeric protein that does not require ATP or any gaps or nicks in the strand, but requires a free 5’ OH group to carry out its function. The 3’ to 5’ human type endonuclease is known to be essential for the proper processing of histone pre-mRNA, in which U7 snRNP directs the single cleavage process. Following the removal of the downstream cleavage product (DCP) 5’ to 3’ exonuclease continues to further breakdown the product until it is completely degraded. This allows the nucleotides to be recycled. 5’ To 3’ exonuclease is linked to a co-transcriptional cleavage (CoTC) activity that acts as a precursor to develop a free 5’ unprotected end, so the exonuclease can remove and degrade the downstream cleavage product (DCP). This initiates transcriptional termination because one does not want DNA or RNA strands building up in their bodies. CCR4-NOT is a general transcription regulatory complex in yeast that is found to be associated with mRNA metabolism, transcription initiation, and mRNA degradation. CCR4 has been found to contain RNA and single-stranded DNA 3’ to 5’ exonuclease activities. Another component associated with the CCR4 complex is CAF1 protein, which has been found to contain 3’ to 5’ or 5’ to 3’ exonuclease domains in the mouse and Caenorhabditis elegans. 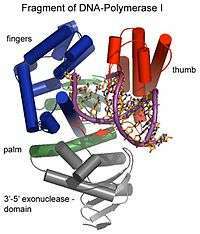 This protein has not been found in yeast, which suggests that it is likely to have an abnormal exonuclease domain like the one seen in a metazoan. Yeast contains Rat1 and Xrn1 exonuclease. The Rat1 works just like the human type (Xrn2) and Xrn1 function in the cytoplasm is in the 5’ to 3’ direction to degrade RNAs (pre-5.8s and 25s rRNAs) in the absence of Rat1. ↑ Mukherjee D; et al. (2004). "Analysis of RNA Exonucleolytic Activities in Cellular Extracts". Springer protocols. 257: 193–211. doi:10.1385/1-59259-750-5:193. ISBN 1-59259-750-5. PMID 14770007. ↑ Pamela A. Frischmeyer; et al. (2002). "An mRNA Surveillance Mechanism That Eliminates Transcripts Lacking Termination Codons". Science. 295 (5563): 2258–61. doi:10.1126/science.1067338. PMID 11910109. ↑ Hage A EL; et al. (2008). "Efficient termination of transcription by RNA polymerase I requires the 5′ exonuclease Rat1 in yeast". Genes Dev. 22 (8): 1068–081. doi:10.1101/gad.463708. PMC 2335327 . PMID 18413717. ↑ Paul D. Boyer (1952). The Enzymes (1st ed.). Academic Press. p. 211. ISBN 0-12-122723-5. ↑ Lehman IR, Nussbaum AL (August 1964). "The deoxyribonucleases of Escherichia Coli. V. on the specificity of exonuclease I (Phosphodiesterase)". J. Biol. Chem. 239 (8): 2628–36. PMID 14235546. ↑ Rogers SG, Weiss B (1980). "Exonuclease III of Escherichia coli K-12, an AP endonuclease". Meth. Enzymol. Methods in Enzymology. 65 (1): 201–11. doi:10.1016/S0076-6879(80)65028-9. ISBN 978-0-12-181965-1. PMID 6246343. ↑ Mishra, N. C.; Mishra, Nawin C. (1995). Molecular biology of nucleases. Boca Raton: CRC Press. pp. 46–52. ISBN 0-8493-7658-0. ↑ Douglas A. Julin (2000). "Detection and Quantitation of RecBCD Enzyme (Exonuclease V) Activity". DNA Repair Protocols. Methods in Molecular Biology. 152. Humana Press. pp. 91–105. doi:10.1385/1-59259-068-3:91. ISBN 978-0-89603-643-7. ↑ Yang XC, Sullivan KD, Marzluff WF, Dominski Z (January 2009). "Studies of the 5′ Exonuclease and Endonuclease Activities of CPSF-73 in Histone Pre-mRNA Processing". Mol. Cell. Biol. 29 (1): 31–42. doi:10.1128/MCB.00776-08. PMC 2612496 . PMID 18955505. ↑ West S, Gromak N, Proudfoot NJ (November 2004). "Human 5' → 3' exonuclease Xrn2 promotes transcription termination at co-transcriptional cleavage sites". Nature. 432 (7016): 522–5. doi:10.1038/nature03035. PMID 15565158. ↑ Chen J, Chiang YC, Denis CL (March 2002). "CCR4, a 3′–5′ poly(A) RNA and ssDNA exonuclease, is the catalytic component of the cytoplasmic deadenylase". EMBO J. 21 (6): 1414–26. doi:10.1093/emboj/21.6.1414. PMC 125924 . PMID 11889047. ↑ Draper MP, Salvadore C, Denis CL (July 1995). "Identification of a mouse protein whose homolog in Saccharomyces cerevisiae is a component of the CCR4 transcriptional regulatory complex". Mol. Cell. Biol. 15 (7): 3487–95. PMC 230585 . PMID 7791755. ↑ Moser MJ, Holley WR, Chatterjee A, Mian IS (December 1997). "The proofreading domain of Escherichia coli DNA polymerase I and other DNA and/or RNA exonuclease domains". Nucleic Acids Res. 25 (24): 5110–8. doi:10.1093/nar/25.24.5110. PMC 147149 . PMID 9396823. ↑ Henry Y, Wood H, Morrissey JP, Petfalski E, Kearsey S, Tollervey D (May 1994). "The 5' end of yeast 5.8S rRNA is generated by exonucleases from an upstream cleavage site". EMBO J. 13 (10): 2452–63. PMC 395111 . PMID 7515008. ↑ Geerlings TH, Vos JC, Raué HA (December 2000). "The final step in the formation of 25S rRNA in Saccharomyces cerevisiae is performed by 5'-->3' exonucleases". RNA. 6 (12): 1698–703. doi:10.1017/S1355838200001540. PMC 1370040 . PMID 11142370.